Just because autumn hasn't sprung just yet, doesn't mean that you can't get a head start on the changing temperatures with a closet update. 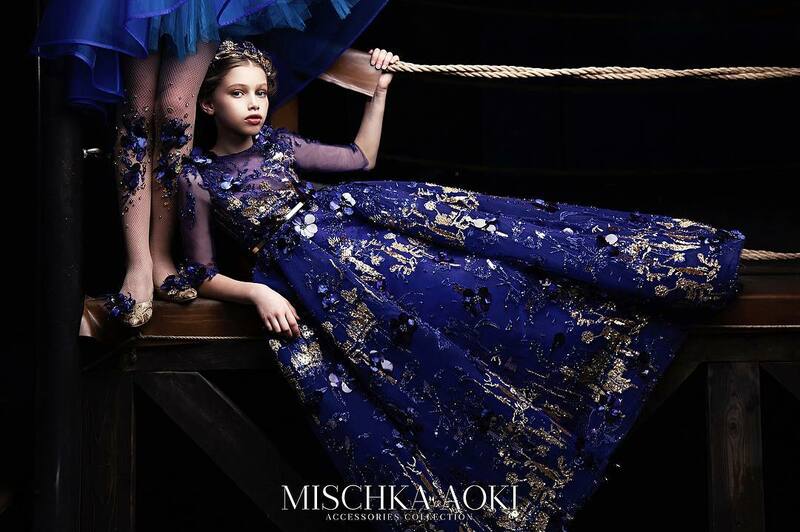 ALALOSHA have gathered some of sparkly shoes of the upcoming season. 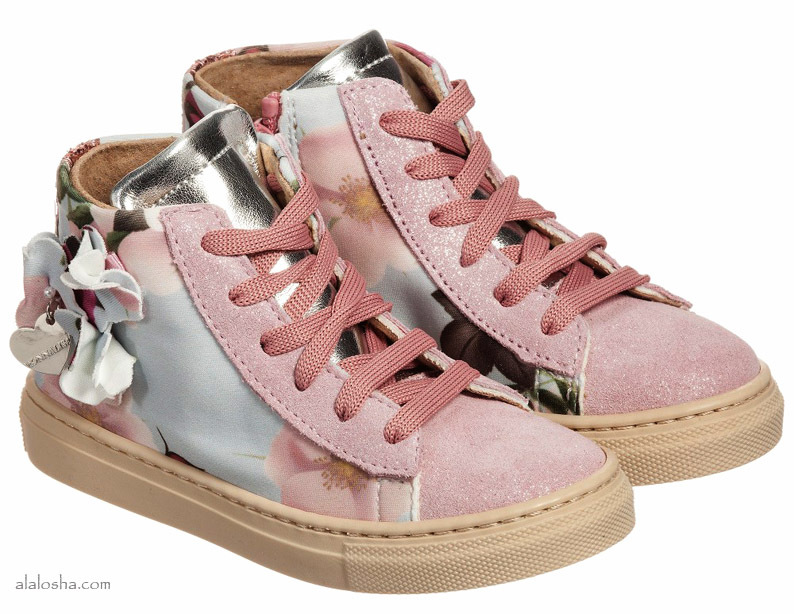 Girls silver 'Bibi Butterfly' trainers by Sophia Webster Mini, made in soft leather and with a soft, synthetic inner lining and insoles. 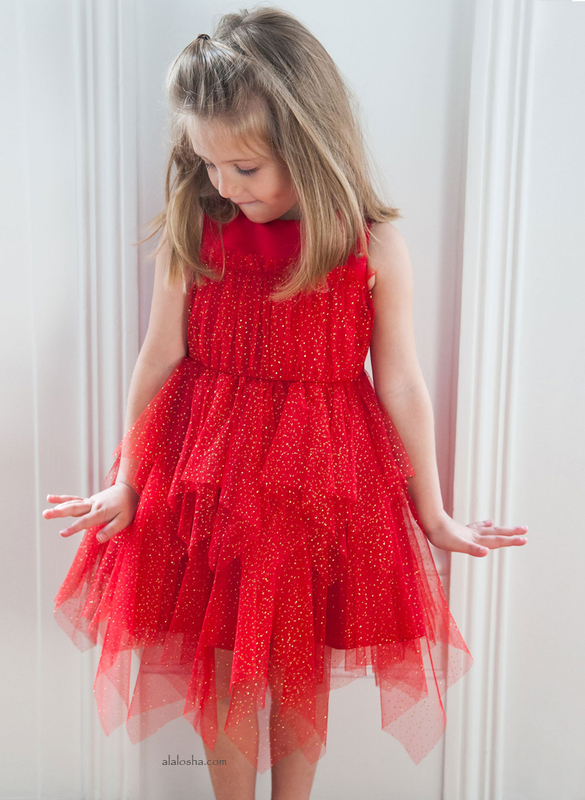 They feature a single, rose gold embroidered butterfly wing on each shoe, which means that, when your little girl stands with her feet together, it looks like the whole butterfly. They have a velcro strap with a rose gold buckle for fastening and their rubber soles are textured for good grip. Girls navy blue suede slip-on shoes by Quis Quis. Made with suede, these shoes have decorative gold and pearl beaded tassels and gold leather piping. With gold leather lining, reinforced heel and toe support, these shoes have a shimmery gold rubber sole and elasticated inserts for ease when putting them on. Girls gold textured suede and leather slip-on shoes by Quis Quis. Made with both gold textured leather and glittery suede, these trainers have a decorative gold stud fringing. With gold leather lining, reinforced heel and toe support, these shoes have a shimmery gold and white thick rubber sole, and elasticated gold inserts for ease when putting them on. 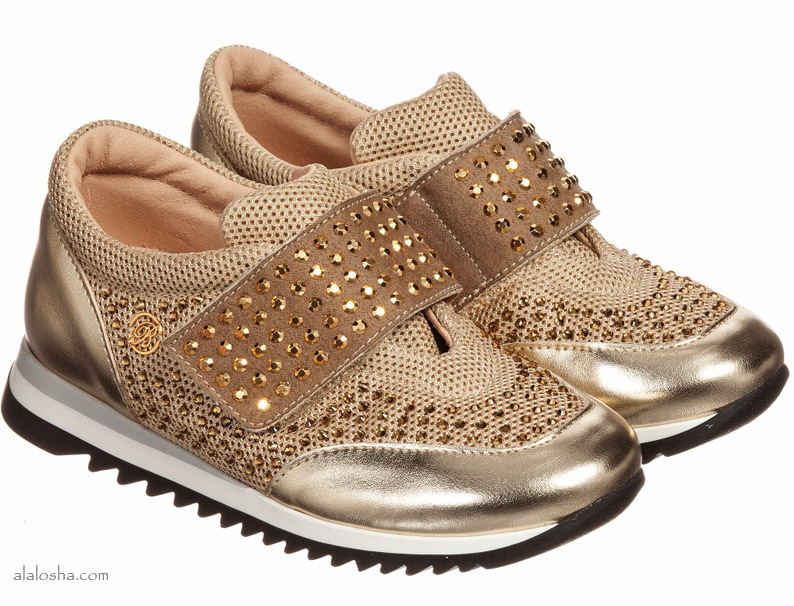 Girls gold leather studded trainers from Miss Blumarine. 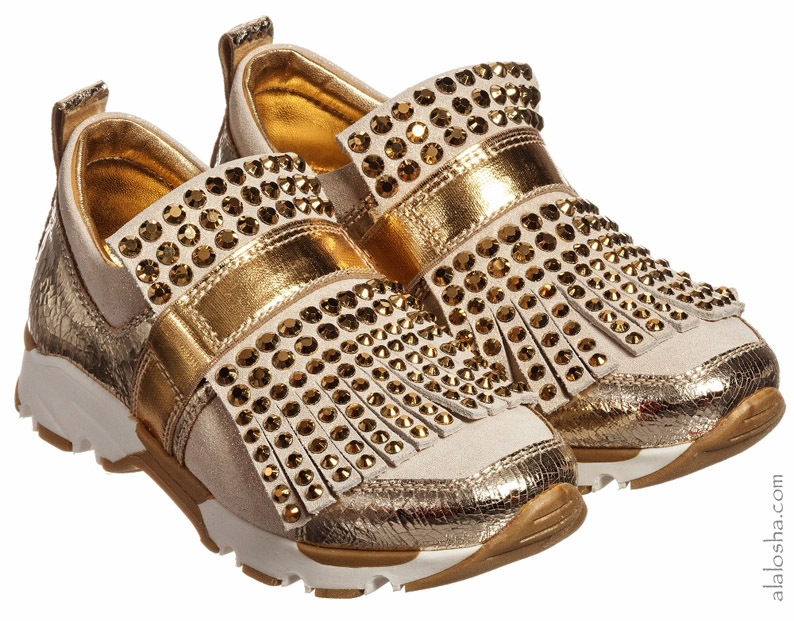 These fab glittery sneakers have metallic toes and mesh fabric uppers with small gold studs. They fasten with a velcro strap studded with larger stones. They are fully lined in leather with a cushioned instep and non-slip rubber soles. Girls pink and blue high-top trainers by Monnalisa. Made in fabric and leather, they have glittery heels and sparkly toes, with pink laces and a side zip fastening. They have a silver-coloured tongue and a floral appliqué decoration on the side. They are lined in leather and have non-slip rubber soles. 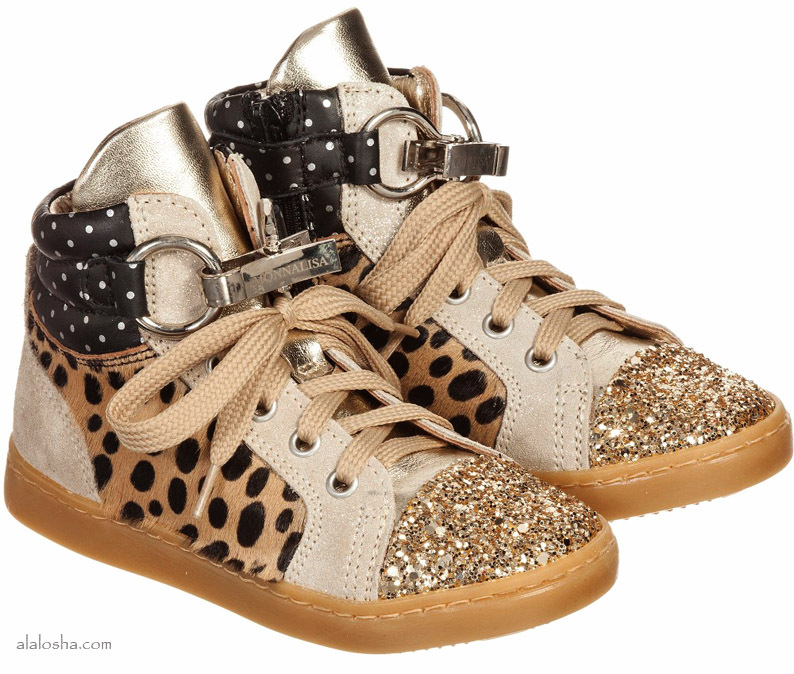 Girls gold and spotted leather high-top trainers by Monnalisa. These eye-catching sneakers have gold glitter toes, contrasting glitter suede panels and beige spot ponyskin sides. The cushioned ankles have a polka dot print and the have a soft, cushioned tongue. There is side zip fastening for easy access, laces and a D-ring clip fastening at the front, embossed with the designer's logo. They are fully lined in leather and have non-slip rubber soles. 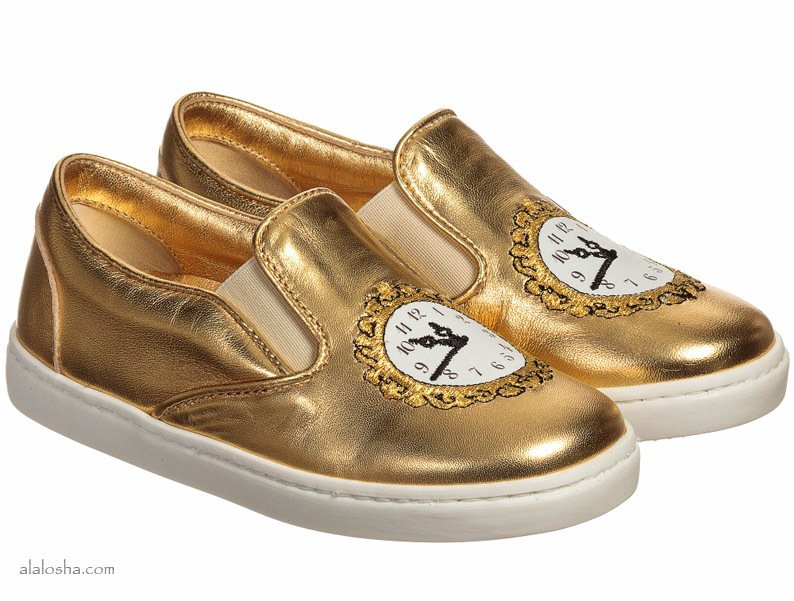 Girls gold leather clock face trainers by Dolce & Gabbana. In a slip-on style, this inspired design has an embroidered Cinderella clock face, set at 5 to midnight. They have a metallic sheen and elasticated inserts to help with dressing, with a cushioned leather lining and non-slip rubber sole.